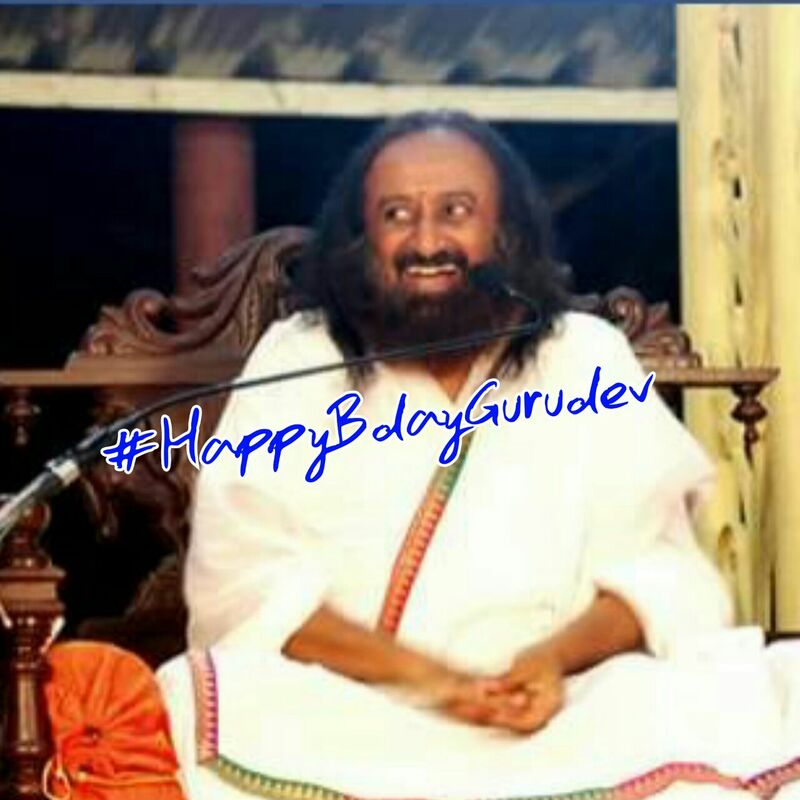 This more of a blog than a post but then the subject is such... What would be the perfect gift for our Dear dear Guruji on his 60th birthday ? Aah! No more guilt now. Then I observed people give him a variety of nice gifts like beautifully embroidered dhotis. I too did that a couple of times. Then realized that the dhoti has to be liked by Guruji and my choice need not match his. I would only be creating one more botheration for Guruji. He would be left with so many Dhotis that he doesn’t need. A few people like Sharmilaji do take extreme care that Guruji’s wardrobe has the right ones. Sweets were another choice. Again how much could he eat? And also would it be right to give him sweets which might take days to reach him and become stale? So that option was out. Cash? It is so convenient but would that really be a good gift for my god on his 60th birthday? My choice became clear when I was travelling and wanted to invite the president of that country to our WCF 2016. We met some important people so that we could reach the invitation to the president. And I was surprised by their response. Though very pleasantly. ALL of them had the same answer “Our president will not come”. It was not a rude answer when we heard their explanation. They said “Our president is a visionary and a great leader. He is already 75. We want to preserve him longer. So we do not strain his calendar in any way except where it has to be. He guides us and shows us the path. We work so that he rests.” Ring Ring !! I realized they not only loved and respected their president. They were so practical also. AND what am I doing? Am I even thinking about our Guru or just myself? I remember since the first day I came to the ashram I would hear Guruji say “give knowledge to a lot of people and fast. There is no time.” The words were prophetic. Perhaps never in history the world would have deteriorated so fast the way it has deteriorated in the last twenty years. Art of living also grew at a phenomenal pace. The more it grew the more busy Guruji became. He is active and working for at least 19 hours every day without a break. Save for the navratri and an ‘agyatvaas ‘ of two or three days in the whole year. Otherwise a typical day for Guruji at the ashram is somewhat like this. Calls start coming early in the morning and go on till late night from all over the world. These are not only from devotees asking for blessings for the beautiful projects they undertake to spread joy, good - health and self reliance or dates for visits but from all sorts of people. Right from government officials of different countries to rebels to lay people call for assistance and help, And they call at their convenience and their office hours. Guruji comes to office around 9.30 – 10-00 A M. Till lunch time the schedule is packed with meetings with different people for the myriad of agendas that people have.--Some of them common to Guruji’s own agenda. After a few reminders the secretaries have to extricate him from people so that he can have his lunch. ( Guruji typically does not have breakfast). After lunch there are more meetings. Around 3.00pm Guruji is extricated again so that he can rest. The rest is usually with a couple of people reading out letters that are written to Guruji from around the world while Guruji is lying down. With Guruji commenting ‘this is taken care of ‘ or “ this must be an old letter it’s already handled’ or ‘remind me about this on such and such day’ etc. Around 4.00 another set of meetings start. And then Guruji gives darshan to hundreds of devotees who have come from many cities and countries, Including one with his pet elephants who become restless from 4.00 onwards to meet Guruji. 6.30 pm is satsang time. Hundreds and sometimes thousands experience bliss with the soulful singing and the master’s knowledge. After satsang Guruji usually has a light supper, followed by a string of meetings. On full moon nights, (rarely) some select singers sing Guruji’s favorite songs. The secretaries then get busy with Guruji on various subjects, including concretizing tentative schedule of Guruji ( which is usually booked 10 months to a year in Advance). Phone calls continue. Around 1.00 am Guruji says Jai Guru Dev to everyone present indicating that they have to go and sleep. While he continues as calls are still coming, a few lucky ones get a call from God. Many times people find Guruji walking in the middle of the night checking the storage tanks, to see if they are full for the next day. IN this busy schedule Guruji manages to visit different projects and developments happening in the ashram almost daily. He also manages to walk to the Gaushala to meet the cows, and the other animals. Some mornings Guruji walks the whole campus. There is no wonder He always knows the minutest details of everything happening around hundreds of countries Many visits in a month are also to Bengaluru city and other nearby cities where people have invited him. Then of course there are those (almost every day) who insist on meeting Guruji NOW because THEY have to take a flight or train. Guruji makes time for them too (somehow). These people go back home happily thinking that they are such great devotees that even Guruji met them before they left the ashram. But I wonder who is the one who is devoted—the Guru to his devotees who break his schedule to meet people- or the devotees, who just to see GURUJI, break his schedule. Phew! This is what he achieves on a physical level in a single day! Who knows how manifold is achieved on other levels when devotees pray to him from all over the world !! When He is in Bhaarat, Guruji visits many cities in a year. Wherever Guruji goes we pack up his schedule very tight. I have also heard of instances where our organizers in their enthusiasm have not only forgotten to eat but also forgotten to serve Guruji lunch. From the bhakta’s point of view, It is understandable that Guruji comes to a chapter rarely and the opportunity to serve him is a rare privilege. For one does not know when He will give the next dates to the chapter again. But we tend to forget that for Guruji each day of the year is the same… packed. I do not think there must be another human on this planet that travels so much, crossing so many time zones so often and continuously for such a long time. Somehow I think Guruji travels so much because we haven’t done our job as volunteers very well. 1) Have we as AOL volunteers and teachers reached our potential? 2) Has ART of living reached it’s potential as an organization? 3) Have we as teachers and volunteers really reached out to the masses, used all the tools effectively, spread happiness and good health to our potential? 4) Have we really got the masses to connect with Guruji who is the one that can make a difference in their lives? If I ask myself the answer that comes from within is NO. I could have done so much more. Especially when I hear of the wonderful stories of our teachers, yuvacharyas and volunteers. If so few of these people could achieve so much of which the whole AOL is proud of, what would happen to this country if all of us could do our bit. Guruji once asked one of our teachers regarding a particular group of people. “Have you made connection with them ?” The teacher replied “we do invite them for all our functions”. Guruji asked “ Do they come?” The teacher said “ No Guruji. They do not come”. Guruji said “that is the connection that we have to make”. In the ashram once Guruji remarked “The 30 to 40 minutes of rest that I get in the Afternoon is the real rest”. With these thoughts I got my Eureka moment. I got what would be best Gift for our Dear Guruji on his 60th birthday. What if our Dear Guruji works only for 30- 40 minutes a day rather than resting only for 30-40 minutes? And our dear Guruji can travel when HIS heart pleases and not because we did not do his work and HE has to do it HIMself ? THAT would be the PERFECT gift for Guruji’s 60th birthday. The best part is that it is very easily doable. How to deal with heartbreak or breakup? Quora: Why does Art of living charges so much money for the course? It's not necessary to be a "blue-star" always! The Rare Earth Element (TREE) - Rishabh Purohit. Simple theme. Powered by Blogger.